Most of the time, a case of red eye is short-lived and disappears on its own. Sometimes, however, red eyes can be caused by a more serious condition. The following danger symptoms in a red eye should be evaluated by a medical professional. Blurry vision is often associated with serious ocular disease. When your doctor checks your vision, even during a routine eye exam, it is a simple, quick way to determine the health of the eye. If a patient can read the 20/20 line on the eye chart with ease, that at least tells the doctor that light is being focused on the retina fairly accurately and the retina is processing the information correctly. However, if your eye is red and your vision is blurry, something significant is going on. If the source of the redness is making your vision blurry, then something is interfering significantly with your visual system. On the other hand, if your vision is blurry without associated redness, then one can determine fairly quickly that the vision may be blurry because your prescription may not be up to date. Conjunctivitis may produce mild irritation or scratchiness, but not extreme pain. Severe pain is a symptom of keratitis, a corneal ulcer, iridocyclitis, or acute open-angle glaucoma. Severe pain should always be evaluated as soon as possible as damage can occur in a short period of time. For example, a corneal ulcer caused by a bacteria called pseudomonas can advance to a blinding eye infection within 48 hours if not treated. Photophobia, or extreme sensitivity to light, is usually a symptom of iritis. 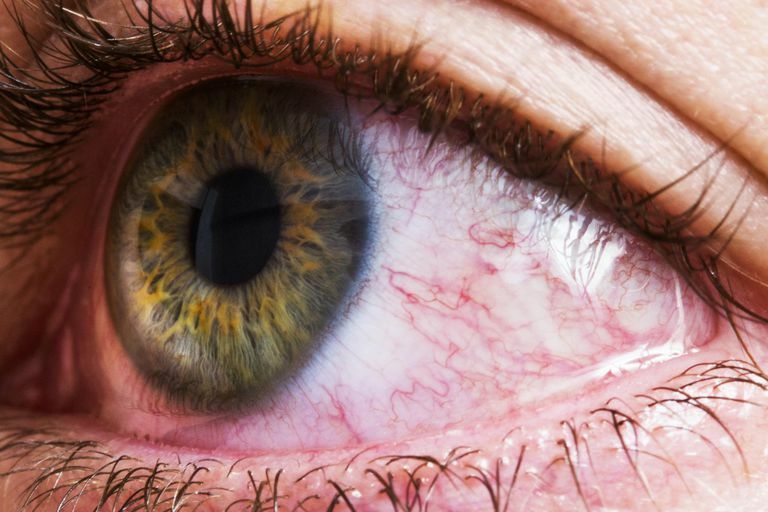 Iritis is an inflammatory disorder of the eye in which the ciliary muscle becomes inflamed and begins to spasm, causing the eye to feel sensitive to light. Light sensitivity is also a general symptom that occurs when the cornea is irritated. A corneal abrasion or corneal ulcer can bring on debilitating light sensitivity. Colored halos are a symptom of corneal edema and acute open-angle glaucoma. Usually, halos seen around lights are caused by a disruption in the optical system of the eye. The cornea, the clear dome light structure on the front part of the eye, becomes thicker, due to the swelling, or edema. As it thickens, it also becomes cloudy. When this occurs, light scatters and we see halos. If you think you may have one of the warning symptoms with red eye, it is important to see a medical professional. R. Douglasss Cullom, Jr., Benjamin Chang, The Wills Eye Manual Office and Emergency Diagnosis and Treatment of Eye Disease, 2nd edition. Rev. ed. of: Wills Eye Hospital Office and Emergency Room Diagnosis and Treatment of Eye Disease, 1990. ISBN 0-397-51380-1. Chapter Differential Diagnosis of Ocular Symptoms, Pages 1-6 and Differential Diagnosis of Ocular Signs; Pages 7-17.